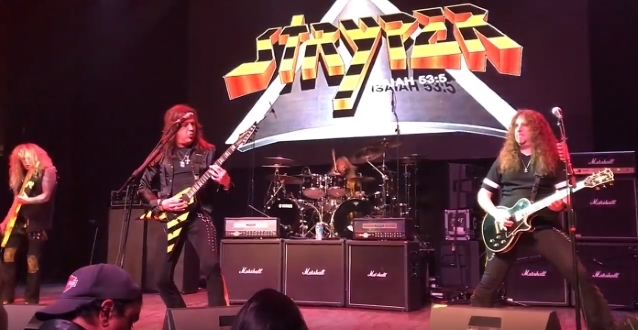 Fan-filmed video footage of STRYPER's September 8 performance at the Arcada Theatre in St. Charles, Illinois can be seen below. This has been a challenging summer for STRYPER. On August 11, guitarist Oz Fox suffered a medical emergency while performing with a side project in Las Vegas. An onstage seizure led to the discovery of some previously unknown "spots" on the brain. Oz has been released from the hospital, although additional testing and treatment will be necessary. However, he should be released to work this fall while his medical team decides the best course of action moving forward. Oz was forced to sit out the Australia tour dates last month, and he'll miss the September dates as well due to air travel restrictions from his doctor. However, he intends to rejoin STRYPER on the road in October. Oz handpicked Los Angeles-based guitarist Howie Simon to fill in for him on the September dates, allowing Oz additional time to rest and recover. Simon will be a familiar face to many STRYPER fans, with performance credits that include NELSON, Jeff Scott Soto, SCRAP METAL, TALISMAN, Eric Martin, WINGER and more. "Howie Simon and I have been friends for well over a decade now," says Oz. "It is great to have him help us out and fill in for me while I am in recovery. I am looking forward to catching some fan videos of him online. He's an excellent performer and his guitar playing outranks so many in the business. In my opinion, it is very important for the band to fulfill dates that have been booked for so long. I am thankful for the continued support of the fans while my STRYPER family and I face this detour in my career, and I look forward to seeing many of you on the road in October and November." "We appreciate all the support, thoughts and prayers from everyone at this time," says frontman Michael Sweet. "We look forward to having our brother Oz back as quickly as possible. We're also very grateful to Howie for working so hard learning the material and parts to be able to sit in with us for the time being. We'll do our best to bring you the absolute best show possible until Oz returns."